Raining too hard outside? Try indoor sports! Just located at the 5th Floor, Fashion Hall, SM Megamall, Arrowland by Gandiva will let you learn the Hawkeye and Robinhood moves. Price: The fee is very much cheaper than what we usually expect. Since it is designed mostly for those who wishes to experience this and the sole reason of having fun, it was priced lower than that of for professionals. 25 shots would only cost 250 pesos. When we came to the place, it was around 3PM only and they give free upgrades for only 500 pesos, good for 2 people with 50 arrows each. Sounds a good deal right? If you are currently thinking that 25 arrows wouldn’t be enough, think twice! It’s harder than it looks. If you don’t really do arms and shoulder exercise, it will ache a lot! 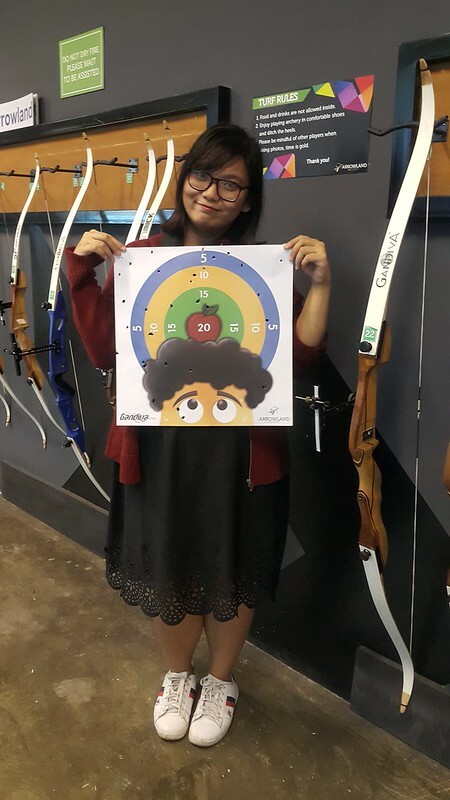 As I am left handed, i had a hard time with the bow. There is a proper stance for it as well. If you are first timer, don’t be afraid! They provide instructors who’ll enthusiastically help you learn how to hit the mark. They usually give additional arrows for trial so it’s a sure thing that you’ll gonna have! 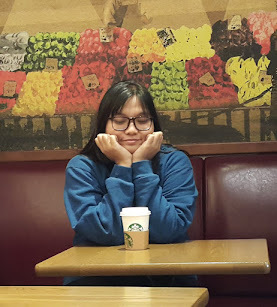 You also have the option to change the target design, you just need to add 40 pesos. My friend wanted this zombie but I decided to go for the kiddie design. The guy with an apple on top! The closest hit I had was the leaf of the apple and I’m already super proud of it! 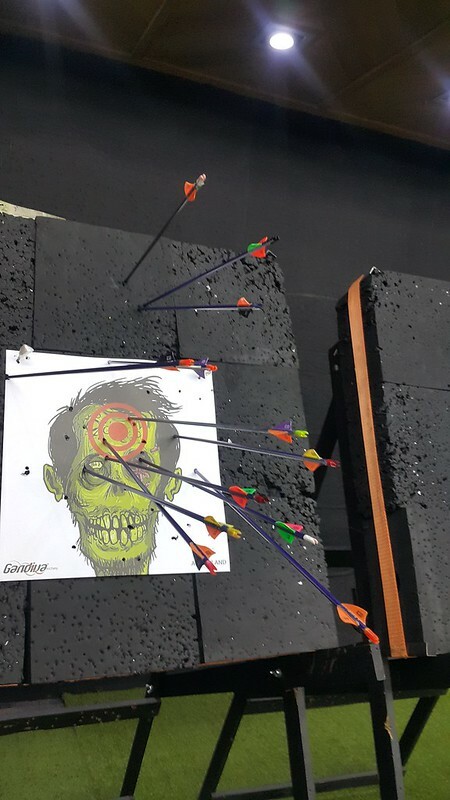 Most of my arrows hit the ceiling and floor. How about that? HAHA. I guess I don’t really have the talent for it. But sure thing is that I had fun! 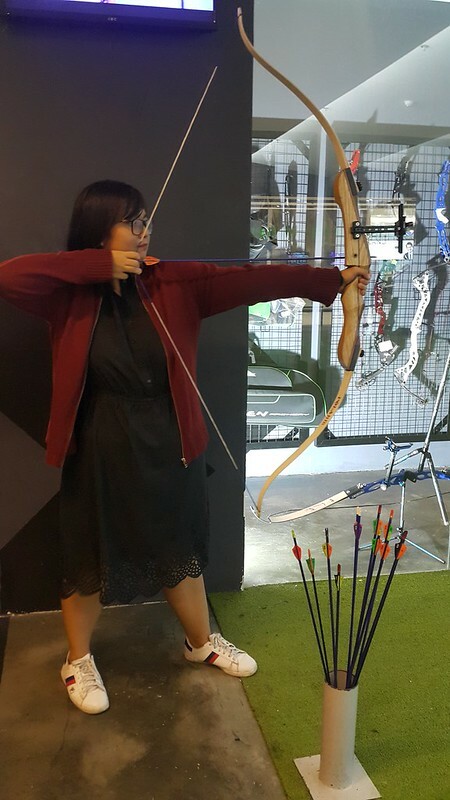 As you can see in my photo, my folded my jacket on my left arm since I had quite a lot of bruises there after the sending off 50 arrows! It’s no joke! Take note: It’s best to try when you are mad! HAHAHA.